This amazing web video, posted by YouTube user, politizane, animates research by Michael Norton (Harvard University) and Dan Ariely (Duke University) about the dramatic differential between people's perceptions and the reality of the wealth divide in the United States. Their findings suggest that Americans overwhelmingly want to live in a more equal society—like Sweden's, specifically—but also that too many people just don't know how bad the economic situation has gotten. Each year, we train hundreds of organizers, activists, educators, and others involved in social and economic justice work. Much of what we do is about engaging people—organizers, activists, educators, and others—in a conversation about the economy, and this video is rich with opportunities for dialogue. You can also play a role. Share it with your online and real life networks. It's easy! Copy & paste this link everywhere: http://bit.ly/YYqIFm. Tell people why you think it's important. Ask for others' reflections. Urge them to consider the implications—social, economic, political, ecological, etc.—of an economy marked by massive wealth inequality. And, encourage them to become involved in efforts large and small to build a new economy on the principles of democracy, sustainability, and cooperation—one where everyone contributes their fair share and everyone has the same opportunity to succeed. Youth activism is always very exciting. We were inspired by the dedication, creativity, and energy of the young people at the annual Youth Jobs Coalition (YJC) rally in Boston. The participants, thousands of Boston Public School students, spent their class recess working together to make the youth unemployment crisis more visible to the community. The YJC demonstration, staged in Boston's Financial District, publicized the connection between concentration of wealth and political power in the financial sector and budget cuts that directly affect funding for youth jobs. The absence of job opportunities is making it difficult for young people to build skills for future success and earn money to help their families. Young people of color are experiencing the greatest struggle. Black teen unemployment, for example, is nearly twice as high as White teen unemployment, which is deepening the racial economic divide. 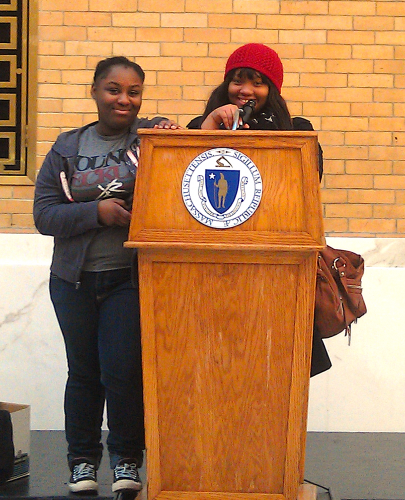 Angie Auguste and Princess Mansaray led lobby day trainings for youth activists at the Massachusetts State House as a part of the YJC day of action. We were disappointed, though not surprised, to see that the first to comment on our posts of support were skeptics who questioned the merits of the teens' efforts. As one Facebook user opined, "maybe being on the streets applying for jobs would have been more productive." In real terms, unemployment may be upwards of 80% higher than reported when we factor in underemployment. Teen unemployment is at a remarkable high, with Black teens faring worst. This should be a concern to all of us because of the many social ills connected to poverty and extreme inequality. We view the actions and continued efforts of these young people through the Youth Jobs Coalition and other groups as a sign of hope. They are making a choice to work together in peaceful demonstration to address an economic system that's falling short, with inefficient allocation of public resources driven by a concentration of wealth and power. We hope you will consider that, in addition to solid individual initiative, we'll need systemic remedies to unemployment and other economic struggles. The momentum for change won't be generated in board rooms and legislative sessions alone. To make the problems and solutions more visible, we have to get some feet on the street with a unified message. As banal as it sounds, young people are our future. Peaceful protest has helped to generate positive change throughout U.S. history. 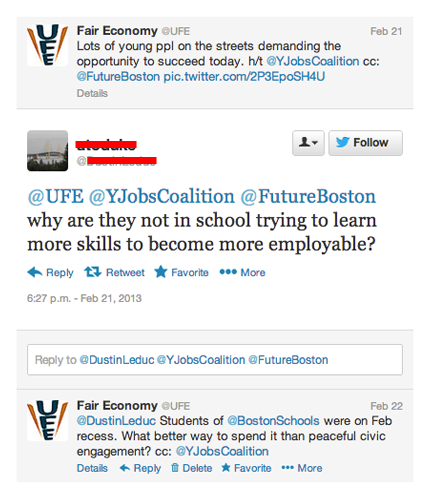 Should we not encourage the youth community to be more engaged in this way? Why is Oprah the Only Black Person on the Forbes 400? Oprah Winfrey is the only African American on the Forbes 400, a list of the wealthiest people in the U.S. In fact, she's one of only six known Black billionaires in the world, and she's the only Black woman with a fortune worth more than a billion dollars. Let's take stock of how truly remarkable it is that Oprah became OPRAH— "Queen of Talk," media mogul, widely-heeded librophile, heavy-hitting do-gooder, and one of the world's richest people. First, note that the Forbes 400 isn’t terribly representative of the U.S. demographic. While Blacks comprise 13 percent of the total population, the Forbes list is only one quarter of one percent Black. The Forbes 400 is a men’s club, with women—the majority of whom inherited their fortunes—making up just 10 percent of the total list. And, with well over half of the Forbes 400 having inherited a substantial fortune and 17 percent having family members on the list, it should be clear that financial success isn’t just a product of intelligence and strong work ethic—often privilege and birthright are all it takes. Racism and white supremacy have been hallmarks of this country since the original colonists washed ashore, and that legacy, which continues to this day, is evident in the current racial economic divide. 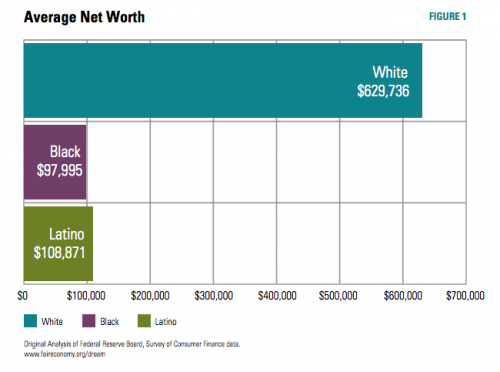 The median Black family, for example, has only 10¢ of wealth for every dollar of white wealth. Based on the rate of progress Blacks have made over the past 30 years, it would take over five hundred years for them to reach wealth parity with Whites. Women have long waited for opportunities to participate as fully in the economy as men. Though women have worked outside the home since the 1800s, they were, throughout history, systemically barred from resources and institutions that could have helped to move them more quickly toward economic parity with men. Today, women earn but 77¢ for each dollar men earn, and there’s no rational argument for why that should continue to be the case. Class barriers restrict the economic mobility of those born poor. The rules of our economy heavily favor the wealthy, making the adage, “the rich get richer and the poor get poorer,” truer by the day. Over 40 percent of those born into the bottom fifth of the economy are likely to stay at the bottom. Over 40 percent of those born into the richest fifth are likely to maintain or enhance their socioeconomic positions. Our country isn’t a beacon of opportunity as it’s so frequently depicted. Neither is it the cradle of democracy that those in power would have us believe. There are similarities between our current system and the nobility and family dynasties of the past. 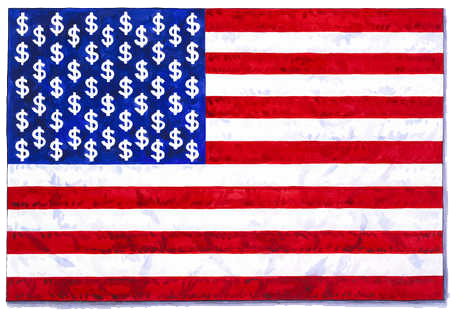 Money has poisoned the well of democracy. The richer you are, the louder your political voice—an idea made more literal with the Supreme Court’s Citizens United ruling that equated political spending with free speech. In this post-Civil Rights era, white supremacy has adapted to function in insidious ways and continues to undermine our social order. Discriminatory policies and practices may be less visible, but the millions of minority victims of predatory lending, citizens who face systemic disenfranchisement by conservative voter suppression efforts, women whose freedoms and self-determination are under attack, and poor communities that are wading through the sludge of poverty can attest to their influence. Post-racialists, on the other hand, argue that race is no longer a factor. To “pull the race card” is to be divisive. Let the past be the past, they say. If you’re thinking, Well, if Oprah did it…, consider that some people, because of race, ethnicity, gender, socioeconomic status or anything else beyond their control, have to work harder than others to realize a life of economic security. As an African American and a woman and a person born in poverty, Oprah has faced more obstacles to financial success than most, if not all, of her contemporaries on the Forbes list. But, as we celebrate her miraculous rise, we can’t deny the existence of those burdens for members of racial and ethnic minority groups and for millions of poor Americans. Oprah is the exception, not the rule. Public policies are intended to govern the masses, and they should be designed to ensure the well being of the masses, rather than overfill the cups of the few. Mazher Ali is the communications coordinator for United for a Fair Economy, a national group working to spotlight the causes and consequences of extreme inequality and racial injustice and supporting the movement for a more equitable economy. Public policies are intended to be a reflection of a country’s values and priorities. In reality, tax and economic policy outcomes represent the wants of the financially enriched, not the needs of the bottom 99%. The U.S. may be a melting pot of cultures and ethnicities, but wealthy, white males comprise the vast majority of our supposedly representative legislature. Nearly half of Congressional members are millionaires. In 2010, the median net worth of U.S. Senators and Representatives was $2.63 million and $756,765, respectively, compared to a median net worth of $66,740 for U.S. households. On the other hand, two historically marginalized groups—women and people of color—are dramatically underrepresented at the policy tables. Women account for only 16.8% of Congress (27% of them are women of color). People of color represent only 15.1% of Congress, with only four seats in the Senate. As such, the interests of the wealthy dominate public debates while policies of particular importance for women and communities of color struggle for acknowledgement, let alone forward movement. Deficit hysteria has prompted harmfully misguided cuts to the social safety net while maintaining unnecessary tax cuts for the wealthy, painting a frightening picture of who our elected officials actually serve. 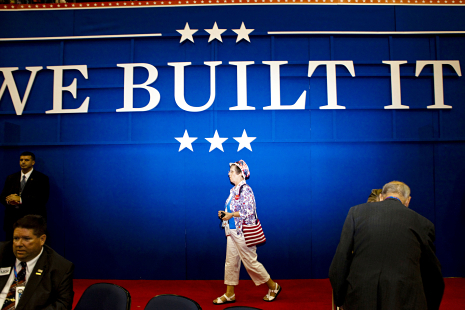 Throughout the presidential campaign, many have the criticized candidates for being “out of touch” with the majority of Americans. It can be reasonably argued that, with a few exceptions, Congress is as well. A recent report by the Institute for Policy Studies (IPS) points out that some legislators have been loyal advocates for the 99%, while others have not. The report, “A Congressional Report Card for the 99%,” grades Senators and Representatives based on their voting histories on inequality-related Congressional actions. While the report’s focus is mainly on policies addressing economic inequality, it leaves room for a deeper analysis of the impacts of policies on persistent racial and gender disparities. Nearly all of the 40 congressional actions evaluated by IPS—including bills related to taxes and the federal budget, jobs and wages, education, housing, poverty, and healthcare—have disproportionately affected communities of color and women. The Paycheck Fairness Act, for example, would have helped to ensure equal pay for equal work. This measure would have been a boon for women, who still make 77¢ to every dollar a man makes. The Senate failed to secure the 60 votes needed to advance the Act. The oppositions’ main argument—that the bill would burden small businesses—is unfounded and yet another strike in the conservative war on women. Another bill, the Half in Ten Act, aims to cut poverty in half in the next ten years. The poorest among us, who are disproportionately people of color, were experiencing economic hardship long before the Great Recession began. Blacks and Latinos respectively make up 27.6% and 25.3% of those in poverty and would benefit greatly by this effort. The bill has 68 co-sponsors but has yet to reach a vote in the House or the Senate. Unfortunately, as politically polarized as Congress has become, even the most sensible policies, like Half in Ten, struggle to gain traction. Moving forward, we should push lawmakers to more carefully examine the impacts of policies on those hardest hit by inequality, like women and people of color. As citizens, we must all fight to make ours a more truly representative democracy, where the voices of those with the biggest bank accounts carry no more volume than those with the smallest. Small Businesses: Self-Made or Built Together? 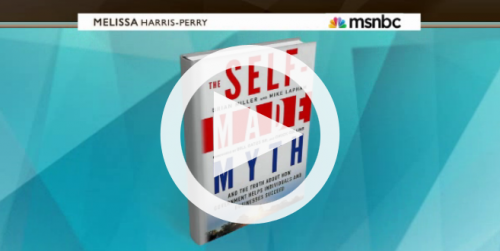 In follow-up to the national political sideshows conventions, MSNBC's Dr. Melissa Harris-Perry hosted a conversation about the Republicans' 2012 slogan, "We Built It." Small business owners discussed the role of government investments—funded by tax revenue—in bolstering entrepreneurialism and job creation by small businesses.